This recipe and story is included in my Dutch oven cookbook, "Around the World in a Dutch Oven"
Truly it is the dessert of the gods. And making it was a lot of fun. It’s simple, yet complex. It’s peasant, yet elegant. Few ingredients combine for amazing flavor. It’s labor-intensive, but every delicate bite is worth the effort. It’s... yeah... You get the point. Plus, I think that baklava’s calories don’t count, right? 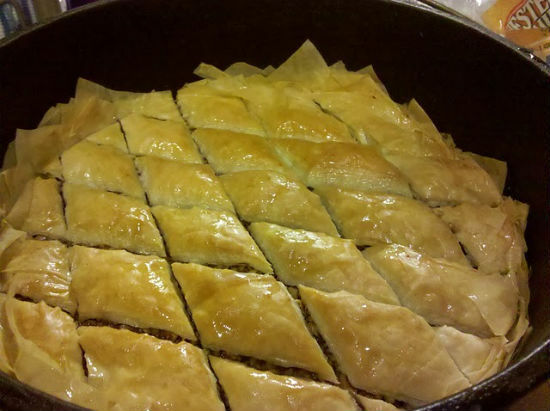 Michelle, my wife’s cousin, told me that when I had asked her to help me make baklava, she had been surprised and wondered if that could be done in a dutch oven. I love to try and cook things in dutch ovens that aren’t supposed to be cooked in dutch ovens! I’m kinda twisted that way. This one will be a little bit difficult to write up, because Michelle is much more of a free spirit in th kitchen. Be warned that many of the amounts that I’ve listed here are approximations and guesses. I remember the ingredients we used, but the measurements aren’t so critical. Also, I think that much of the success of baklava is in the process, not so much the exact amounts. Water to make a medium-thick syrup. We started by mixing the first set of ingredients. It’s pretty straight-forward. Chop up the nuts, mix in the sugar and the cinnamon. It does work better if the brown sugar is fresh, otherwise, you’ll have hard chunks to break up. Not fun. Then it came time to make the layers. We simply melted the butter in the microwave. It would be easy enough to simply put the 8” dutch oven on a few coals and melt it that way. In fact, you could keep a few coals on it during the layering process and it would keep it from cooling and solidifying. You don’t want to boil it. Then, we unrolled the Fillo dough (store-bought) from the package. It was a wide rectangular stack, which we cut in half (to a little bigger than an 8.5x11 sheet of paper). The two halves were stacked on top of each other, then put on top of and underneath sheets of wax paper. That was all topped with a slightly damp towel, to keep the Fillo dough moist. With a pastry brush, we spread a little butter in the bottom of the dutch oven, then spread one of the sheets of Fillo dough. 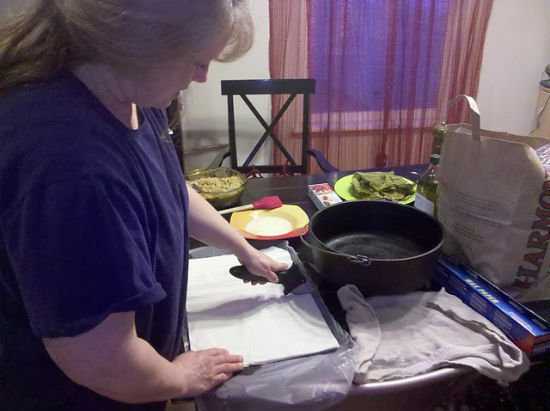 With the brush, we brushed butter in the corners of the “paper” and gently over the dough’s surface. The next one we put in the same way, but at a 90-degree angle. We brushed butter onto that one as well. We went on stacking, layering Fillo, butter, Fillo, butter, each sheet at a ninety degree angle, crossways from the one below it. I wondered if it would work to do it at a 60-degree angle, and go around the circle in sixths instead. I doubt it would have made much difference. After about a third of the total layers of fillo dough, we spread an even layer (not too thick) of the nut and sugar mixture, enough to cover the dough. You shouldn’t be able to see through the nuts to the dough, but no deeper than that. If you don’t already have coals burning, you should go out and light them at this point. We already had coals lit and cooking the dolmades. Then, we got back to the layering, for another third of the dough. We followed that with another spread of nuts and sugar. At this point, your coals should be nice and hot. We put a whole bunch on the dutch oven lid, and let it pre-heat. Finally, we layered the rest of the dough. The next step was to get a knife and cut the slices. This is where you can make the characteristic diamond patter. I don’t know if this is anything other than tradition. It could be rooted in some esoteric cooking reasoning. I don’t know why it’s done. You do need to cut it, and it needs to be cut at this stage because it will be to crisp and crackly to cut later, and the syrup needs to be able to run down into the baklava. However, I don’t know why it should be done in diamonds. While that was cooking, we made the syrup. Actually, we ate the dolmades and the soup. But had we been really on top of things, we would have made the syrup while the baklava was cooking. We did it on the stove top. If I had been going “purist-style”, we would have made the syrup in my 8” dutch oven. Simply combine the syrup set ingredients and simmer until it’s the right consistency. Not as thick as the honey, but not as runny as the water. Somewhere in between. We put it on the coals and cooked it for about a half hour to 40 minutes. When the top layer was a nice golden brown, it was time to take it off. With the baklava baked and brown, and the syrup ready, simply pour the syrup over the baklava. 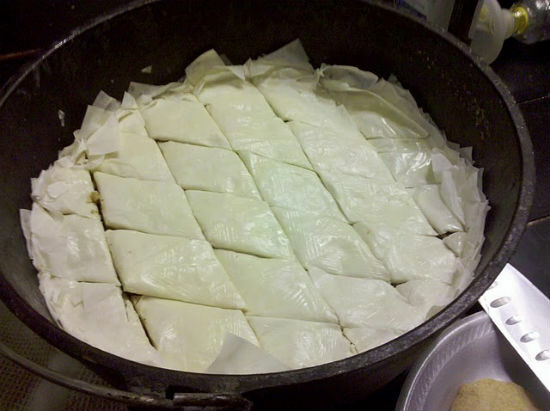 It will run into the cracks between the baklava pieces that you cut, and soak into the fillo dough layers. That will give it that sticky, gooey sweetness that you love so much about baklava. Then, let it cool a little, and serve it up! Ours didn’t last long, so I have no idea how long it’ll keep! Cooking in a Dutch oven can be so much fun! Here are some camping Dutch oven recipes! Oh boy so simple but soooo good, very clever at first I thought you were going to cut the sheets into circles :). I will have to give this a try. Did you mean 2 CUPS of walnuts for this recipe? Silly question... This sounds super good.